Considering that the white European settlement of Melbourne is only 173 years old, its establishment was a spluttering affair. The district of Port Phillip is located on the lands of the Wurundjeri people of the Kulin nation in the south-eastern corner of mainland Australia. Fitful and unsuccessful attempts had been made to establish a British base there in the early 1800s, spurred on largely by anxiety over French explorers in the vicinity, but until the 1830s the land remained known, charted, but largely ignored by the British government. Claims for the credit for the actual establishment of Melbourne have been contested over a number of years between John Batman, John Pascoe Fawkner, the Hentys, and even more recently the acting commander of Fawkner’s ship, John Lancey. Irrespective of the technicalities of ‘founding father’ status, the important thing is that both Fawkner and Batman were responding to similar imperatives: the paucity of available land in Van Diemen’s Land and the entrepreneurial pull of unclaimed land over the narrow but often treacherous Bass Strait. At much the same time, the surveyor-general and explorer Major Thomas Mitchell conducted his third expedition out from Sydney. He travelled along the Darling, Murray and Murrumbidgee rivers, then down to the Loddon River, crossing into what is now Victoria. Impressed by the land and its potential, he designated it “Australia Felix”- indeed our Judge Willis often referred to himself as “The Resident Judge of Australia Felix”. He was followed by a wave of overlanders, bringing their cattle down from the middle district around Sydney into the ostensibly “unoccupied” lands to the south. Thus, movements into early Port Phillip came from two directions: down from Sydney and across from Van Diemens Land. The attitudes brought with these two competing waves of settlement contributed to the nature of Port Phillip society as Judge Willis found it when he arrived in 1841. Both Sydney and Van Diemens Land had been consciously established by the Colonial Office in London as British penal colonies, under the direct control of the Governor, his troops and convict overseers. Port Phillip, on the other hand, was settled unofficially by free individuals under their own initiative. The NSW government, recognizing the futility of trying to stop development that was more successful than its own aborted attempt thirty years earlier, annexed the new settlement as part of the mainland NSW colony even though, geographically, Van Diemens Land was closer. Defiance and determination to establish the settlement despite Sydney’s ambivalence existed side by side with an eagerness to adopt the trappings and structures of British civic society- hence the early demands for a Resident Judge and British justice to support the entrepreneurial activity of the district and as a symbol of its legitimacy as a British colonial port city. Indeed, many of the fault-lines exposed by the Judge Willis controversy can be seen to stem from the competing values present and implicit in Port Phillip from its inception: its pride and superiority at being a ‘free’ colony, determination to be independent of NSW, and the tension between entrepreneurial wealth and social respectability. 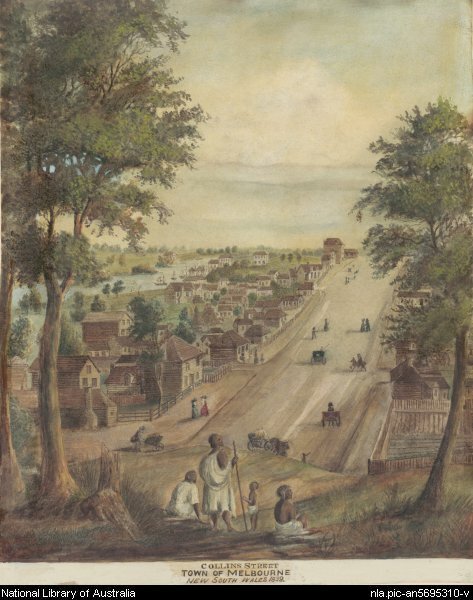 By the time Justice Willis arrived in the Port Phillip district in 1841, there were about 5000 people in the environs of Melbourne and about 7000 across what is now Victoria. The town of Melbourne rested beside the Yarra River which was bisected by a rocky outcrop at about the level of William Street today. These ‘falls’ separated the tidal water of the bay from the fresh water of the river that flowed down towards the bay from Healesville, but prevented river access further upstream. Ocean going ships had to anchor out in the bay and steam ships shuttled back and forth between the bay, Williamstown, Geelong and between Sydney, Launceston and Hobart. The streets were unmade and in places, still dotted with tree stumps and gouged with channels of water when it rained. Canvas tents had been replaced by wattle and daub structures, and single and double-storied brick dwelling were beginning to be erected. Most development occurred between Spencer and Elizabeth streets, with a concentration around the Market Street/Collins Street/Flinders Lane area. Judge Willis’ appointment in Melbourne was emblematic of the increasingly official civic nature of the town. Now that Supreme Court hearings would be conducted in Melbourne on a regular basis, barristers and solicitors and their families moved to the area as a conscious career choice. Churches and schools began erecting their first permanent buildings. Cultural organisations like the Melbourne Debating Society, lodges, the Mechanics Institute were established. Balls, concerts and theatre performances were staged. One of the three local newspapers was published each day except Sunday. A street life sprang up where people watched, and were watched themselves. A political milieu emerged alongside, and was intimately intertwined with this cultural development. Men exhibited their financial independence and civic visibility through involvement in the major political hot-topics of the day: Separation from New South Wales; election onto the Melbourne Town Corporation; pledges and petitions of support for public figures, and requisitions for public meetings to discuss and petition for government and Imperial actions. The province was under the control of Governor George Gipps in Sydney, six hundred miles away, but the immediate oversight of the district was overseen by Superintendent Charles La Trobe, a relatively inexperienced administrator. The political climate of early 1843 in Port Phillip is closely related to Judge Willis’ sacking in June 1843. It was on the eve of the first Legislative Council elections, ‘party’ divisions had opened up during the earlier Melbourne Corporation elections and were being played out within the politics of the new town corporation, Judge Willis was publicly criticizing government officers, and La Trobe felt under attack. I’ve listed them alphabetically by location, then alphabetically by object.